And believe it or not, for our personal situation with the cars we already owned, switching the remaining gas vehicle with a new EV is cheaper over the long haul (I’ll explain more in another post). This is a once in a lifetime opportunity, due to the fact that EVs have a fundamentally different life cycle cost profile from gasoline vehicles – operational & maintenances costs are much lower for an EV, more than offsetting the current additional capital outlay in a typical vehicle’s lifetime. The good news is that as EVs reach cost parity with fossil cars… you’d be literally burning money to keep that “sweet” gasoline/diesel exhaust fume smell and infernal racket under the hood (i.e. you probably are a fossil if you elect to hold onto technology that has clearly peaked). All future vehicle choices, once the EV revolution levels out and gas cars are largely replaced, will follow the generally accepted adage of buying used to be fiscally prudent (of course someone has to buy new cars, thanks to those of you who have the means to do so!). The next 5 – 10 years is quite possibly the most confusing time to be purchasing a vehicle since we switched from horse drawn carriages to cars because of the huge technological shift. Is it environmentally-friendly to be getting another car and replacing our gas car early? Our Subaru Forester is a 2011 model with only 108,500 km on it. It has at least double that left for its lifetime before someone eventually scraps it. Here are two ways to look at it, one a thought-experiment, the other some numbers! Thought experiment: if we sell our current (well maintained!) 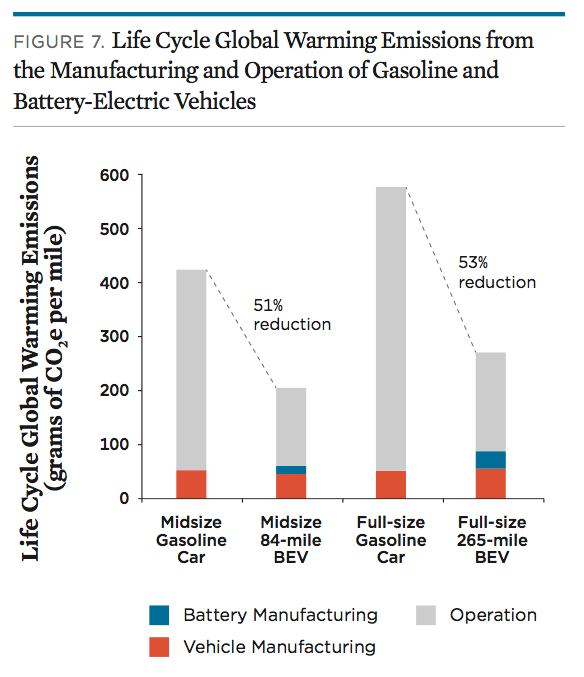 gasoline car and buy an EV, is that a net benefit? Well, whoever does buy our gas car would have been buying a vehicle anyways, and likely replacing an older beater of some kind that is now in poor condition and producing a lot of other pollutants beyond just CO2. By supporting the current EV industry, we are helping to drive down costs overall and voting with our $. My opinion is that it is a net benefit. 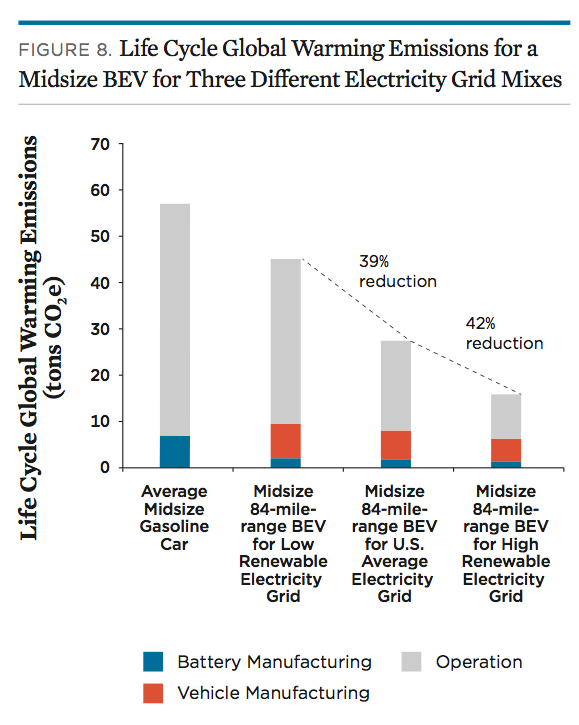 Comparing energy mixes for emissions… and yes we are the far right (or possibly even further to the right off the graph) – note a minor typo in the graph for the colour of the gasoline car, that bar should be orange, not blue. Lastly, the new long range EV we are purchasing should last roughly 500,000 km (or maybe even more, check back with me in 20 years! ), meaning our emission reductions from this one purchasing choice will be on the order of 90% less than if we continued to drive gasoline vehicles. what vehicle are you buying, Andrew? If you are going the Tesla route, feel free to contact me for any user-oriented questions… there’s a 3 in the family now in addition to my S, so I’ve got a pretty good feel for both. And you’d be fine to use my owners code for whatever benefit it provides if/when you buy… brock8103. congrats on the Model 3! Mid range I assume? As for the new EV lasting 500,000km, I think you are being optimistic on that one. Yes the Model 3 should definitely drive 500,000km without too many issues, but I doubt the battery will last 20 years without significant degradation or failure. The more we learn about electric vehicles, the more we see that age is the primary enemy, not mileage. Even the mediocre batteries in the Leaf do quite OK with high mileage, but seem to steadily degrade with age no matter how they are treated. I’d say it’s more about charge cycles than age actually. 100,000 km on my Model S which is coming up on 4 years of age. Degradation appears to be in the 1.5-2% range at this point. And data from Tesla owners worldwide seems to indicate that the rate of degradation slows after an early-ish drop. The Leaf battery is probably the worst system to use in modeling battery life and degradation. Thermal management is essentially zero. But you are talking about a battery that is 4 years old and using that to make assumptions about performance over 20 years. What are the chances that none of the thousands of cells in your Model S will fail over 20 years? We have no data on that. And the data on battery degradation is self-selecting and doesn’t account for all the batteries that failed completely. That is not an accurate guage of battery reliability. I’ll probably reach 400,000 km in 10 years, so I’m pretty sure I’ll get that far at least. As Brock notes, the Leaf has (so far) the worst degradation rate of any EV out there due to a combination of chemistry chosen and lack of high temperature thermal management (of any kind). My Leaf is at 82%, turns 5 in February 2019, and currently has 175,000km on it. If that turns out to be roughly linear, it will be at 64% in year 10 with about 212,000 km, which will still suit our local driving needs. Everything I’ve read on Tesla batteries is that they degrade at a slower percentage rate than Leaf packs, so I’m pretty comfortable that I’ll reach at a minimum 10 years. I have no doubt that the LR RWD will be a great car for you. My mother took delivery of her Model 3 in September (she’s 80!) and is really loving it. Range is ridiculous. Everyone I know with a RWD S or 3 tells me the traction control is amazing. I can’t comment because mine is dual motor, other than to say that it just DOESN’T lose traction! You can mat it on a gravel road, or with one side of the car on asphalt and the other on gravel, and it accelerates straight and without a rooster tail of gravel behind. If you want any direct Tesla ownership answers or thoughts, Andrew, please feel free to contact me directly… brock at nanson dot net or 250 314 7769. My owners code is brock8103, which almost always gives a buyer some sort of perk – you’re welcome to use it. It used to be that the owner got something when a code was used too, but our provincial government decided owners aren’t licensed car salesmen, so can’t receive any benefit from the referral program… so it’s now more about providing a support system for prospective buyers and new owners. And having Tesla know we’ve been helping the mission. The data we have is that for Tesla packs that don’t fail, degradation seems to be low. However what we don’t have is the failure rate. I’m concerned that in the long term one of those thousands of cells will fail, and it seems that especially on the Model 3 they are not repairable so then you replace the whole pack. I’m sure you’ll make it 10 years, but 20? A complete unknown at this point. We don’t have any lithium batteries that old. As for the Leaf batteries. I have a 2013 with 65,000km on it, and it is currently at 86%. It gets driven 10,000 km/year and I completely baby it by keeping it stored at damn near 50% throughout the week when I’m not using it, and usually only cycling between 70% and 30% with the occasional full charge. Really hasn’t made all that much difference to degradation, the SoH still dropped steadily during my ownership period (2 years). When I bought it 2 years ago it read out 95% but I assume it was miscalibrated or had been reset because within 4 months it dropped to 90%. It’s true that we don’t have much data through time, but the indications are looking better with every passing year. It all relates to a blend of battery chemistry, thermal management, charge management, usage patterns and blind luck. The batteries in the Model 3 are a newer variant than what I have in my S. I fully expect them to be better than what I have… and what I have is looking good. 8 years and unlimited km’s for warranty, so I’m not at all concerned just yet. The Model 3 is 8 years and 192,000 km I believe. I’ve witnessed the technicians plug their laptop into the car and see the entire array of cells. I have no idea how they manage it technically, but they can see if a battery is failing. And the pack somehow adapts – meaning a failing cell apparently doesn’t take the pack down. Or so I inferred from the tech’s comments. And given that they’re in multiple modules, replacement may be more practical than one might expect. However, the key detail to recognize is that when a Tesla owner decides it’s time to replace the pack, the pack contents still have significant value as – for example – stationary storage. So there would presumably be an offset value (core credit) against a new pack. Tesla is closing in on the elusive $100/ kWh (USD) price point for cells we understand. I expect they’ll reach it and continue below it. So the batteries in my 85D would be worth $8,500 USD or so (plus pack cost) as of today. By the time I may need to replace at my own cost, the price will presumably be lower. And the core cost would likely apply. I have read that Nissan is also re-purposing Leaf batteries as they are cycled out of the cars. One thing to note on checking the Leaf State of Health via LeafSpy, it has seasonal variation. It is only really accurate in mid fall and mid spring I find. Summer it is artificially low, winter it is high. Swings almost 5%! My Pentax K7 is a bit over 9 years old now, and the battery is still going pretty strong. I’ve taken tens of thousands of shots on it and cycled the battery a lot. I think if that little consumer battery can last that long, with no effort to prolong its life, I’m reasonably confident the Tesla pack will last that long at the very least. I do wonder about calendar life failure… my Leaf will be my canary! Next Next post: We bought a….